Lane’s Brigade, aka: Kansas Brigade (1861) – After the Battle of Wilson’s Creek, Missouri on August 10, 1861, the Union army retreated. 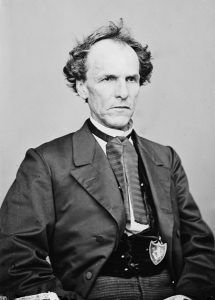 With the border exposed and General Sterling Price’s men threatening the “free-soilers” of Kansas, General James H. Lane began the work of organizing troops for defense. He quickly began recruiting and within a short time, the Third, Fourth, Fifth, Sixth and Seventh regiments were ready for service. Lane took command of some 1,500 troops at Fort Scott, Kansas and led them into action against General Price in the Battle of Dry Wood Creek on September 2, 1861. Though, his troops lost the battle, Lane continued on, fighting through the towns of Paninsville, Butler, Harrisonville, and Clinton, Missouri, before he ended his campaign by the burning of Osceola on September 23, 1861. The troops continued to pursue Price’s men for a time but Lane was severely criticized for his actions in Osceola and soon sent back to Kansas. Lane was most severely condemned by General Henry Halleck, Commander of the Department of Missouri, who believed that the attacks made by Lane and Colonel Charles Jennison, aggravated anti-Union sentiments in Missouri and intensified resistance to federal authority in the state. Of their actions, he would state: “The course pursued by those under Lane and Jennison has turned against us many thousand who were formerly Union men. A few more such raids will make this State unanimous against us.” Thus, Lane’s Brigade was ended.